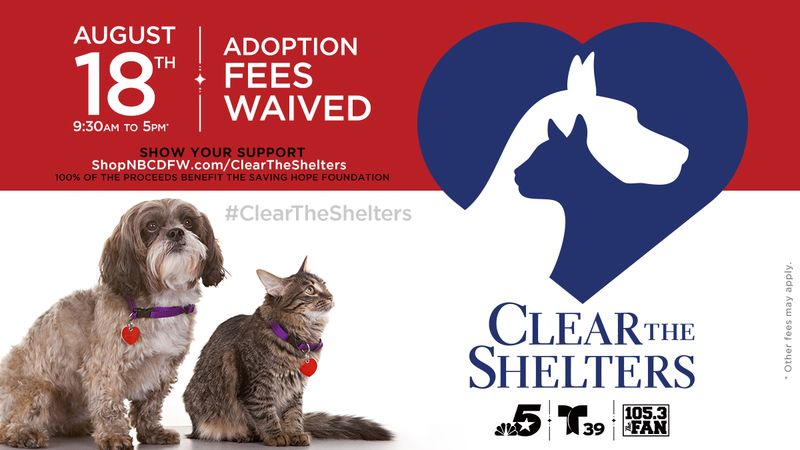 To locate participating shelters across the country, visit ClearTheShelters.com. For the fifth year, North Texas shelters, along with NBC 5 and Telemundo 39 are planning a huge adoption event. This year’s nationwide Clear the Shelters adoption event will be held Saturday, August 18 from 9:30 a.m. to 5 p.m. The exciting event brings cities, counties and nonprofit organizations together to offer a unified campaign. Below is a list of locations, adoption policies and other important information regarding Clear the Shelters in North Texas. Make an animal’s dream come true. Adopt. Thank you to Texas Coalition for Animal Protection for helping participating shelters get ready for Clear the Shelters! VIEW AN INTERACTIVE MAP OF ALL CLEAR THE SHELTERS PARTNERS!